Travel along with the the Tea Docents as they search for all things tea. Jim Shelly and Family on Where in the world are the Tea Docents? Vermillion Asian Arts on Where in the world are the Tea Docents? Susan Bain on Where in the world are the Tea Docents? Jose Hernandez on Where in the world are the Tea Docents? We will depart San Francisco for Kansai Japan. We are both so looking forward to this trip! We will be traveling with two of our dear friends and together we are sure to make new ones as we cruise around Japan and Korea on the tiny Spirit of Oceanus. We will arrive in Osaka and are looking forward to family greeting us at the airport. It will be a very fast visit for the exchange of gifts and hugs before we drive to Kyoto, one of our favorite places on the planet. First stop will be the Kitano Tenmangu Shrine, Sugawara Michizane, the patron deity of learning is enshrined here, the famous mass tea ceremony was conducted here and many artifacts are among this shrine’s treasures. But today we will enjoy the Shimai Tenjin Flea Market here in search of our own treasures. We have lunch planned with our exporting agents and look forward to spending time with them. We also hope to connect with a new friend who is working with a group that restores historic homes in Kyoto for a peak at the progress. A short trip Nara to visit the Todaiji Temple to see the Daibutsu (largest bronze Buddha in the world) and the Horyuji Temple, the oldest Temple in Japan. We seen both before but hope to get good photos this trip to share, before we head on to Kobe. Explore Kobe and her natural beauty. Mt Rokko can be seen from here as well as the breathtaking Seto Inland Sea. We have not been and look forward to discovering some of the exotic atmosphere we have read about before we embark the Spirit of Oceanus. We are looking forward to the small ship experience. The Spirit will take only 80 passengers on this voyage and we excited to be among them! Takamatsu, home to the Ritsurin Garden which took over 100 years to create is our first stop. I know most would think I am crazy but I hope it rains a little during this visit. I find Japanese gardens even more beautiful in the rain. Sunshine or rain I am looking forward to our walk here. Up the hill and on to photograph the preserved structures that make up Shikoumura Village. Our first port today will be Okayama home of the very beautiful Korakuen Garden. We have strolled this place many times yet always look forward to returning. Kurashiki, one of Japan’s best-preserved historical neighborhoods is our next stop I am looking forward to some wonderful photos. During the Tokugawa period Kurashiki was a farming area renowned for its Bizen-mai Rice, maybe we can sample some. Truly one of the most spiritual places I have ever been is where we spend our day today! Of course you know I am speaking of Miyajima! We have seen it with the sakura(cherry) blossoms blooming, in full fall color glory, at night, with the tide out and with the tide in. Regardless of how or when I ALWAYS feel the strength of beyond earth in this magical place. We will actually stay as our group moves on to Hiroshima later today and catch back up before sailing to Beppu late tonight. The town of Onsens (outdoor hot spring baths) Beppu is always a treat. Our tour will include the Jigoku a fascinating area of springs sometimes called “The Hells” you can not get in any of these but they are amazing to see. Onsens are one of the things we miss most when we are not in Japan so later we will visit Yufuin and spend some time simply soaking in the rich hot water. Nagasaki is our next port. It is a large rebuilt city with the famous Peace Park and Memorial Museum. Nagasaki of course is the second city destroyed by Atomic Bomb after Hiroshima. A place everyone should experience, we have a couple of times, so I think we will look for a nice teashop to discover today. Leaving Japan we will arrive in Kyongju, South Korea. We have not yet been to this famous pottery town and are looking forward to seeing the Shilla kilns and maybe make a new pottery source connection. Kyongju is a UNESCO site today and we excited to see the Bulguksa Temple. With pottery still on our minds, I am sure, we will happily arrive back in Japan in the picturesque town of Hagi. We plan to visit the home of “national living treasure” Nosaka-san who is known for his great skill in Hagi-yaki. It would be wonderful to be able to acquire a small piece. Next we will pay our respects to one of the last samurai as we visit Yoshida Shoin Shrine and the Daisho-in Temple before returning to our ship. Today is our wedding anniversary! We were married by a Shinto Priest, spent our first anniversary participating in some Shinto rituals with him in Japan and now our second anniversary we are yet again in Japan. I think we are going to make it a tradition! Today we will visit Matsue AKA “The City of Water” with over 500 bridges connecting people and places a symbolic place for our special day. Kanazawa and yet another FABULOUS garden! The Kenrokuen is known as one of the three most beautiful in Japan. We have been to all of them! Hmm come to think of it, we have been to several that are one of three. Regardless of the “official” ranking I agree, there are hundreds of gardens in Japan that are in the top three depending on the day and your frame of mind! I know we are going to enjoy it. I am also looking forward to tasting some sake here. The climate is perfect for good rice and so the sake should be a treat. We leave our ship but our journey is not complete just yet. Next we will board the bullet train for Tokyo. This is most likely when we will realize we may have purchased a few too many things to easily carry, but no worries, in Japan you can have them delivered to the airport for safe pickup before our flights home. WHEWW that is a life saver! Leaving our big group it is now just the four of us and we plan to see Mt Fuji and Hakone today! So many people try and so few actually see the top of the mountain. We have seen it twice before and hope our luck holds and our friends are able to see this awesome sight! Nikko the Kegon Waterfall and the another UNESCO site all to be enjoyed in the glory of what promises to be fabulous fall color! I am excited to feel the brisk air on my face and take in all the colors which often seem more like a painting. Not sure yet  Maybe Kamakura and the HUGE Buddha, small streets of local shopping and that wonderful some town feeling only an hour from Tokyo. Or maybe we will take in the rush of this one of a kind city. We will just see how we feel. All too soon we will be leaving Japan. Every time I come I hate to leave every time I leave I want to come back. I am sure this will be no exception. I hope our friends have the same experience and again visit Japan, maybe to enjoy Sakura next time! We left SFO on with a "plane change" and seats that were not as great as we had planned. The good news is they were at least in Business Class and so even with the less than optimum conditions, still WAY better than economy! After our 11plus hour flight we ended up in a line to get through immigration that was so SLOW that our family that was meeting us thought for SURE she had missed us! It was pretty BAD over an hour, not what we normally see in Japan. Finally we see Midori-san, exchange gifts, hugs and stories. She brings us our Japan cell phone and so we now feel CONNECTED again :-) We have done this exact greeting/meeting many times and at this point we normally get on a train and efficiently enjoy our bento box/sake and ride to Kyoto, ALWAYS the BEST way to travel in Japan. However since we will be joining a group for a cruise they have arranged for a coach to pick us up. That is the bad news, the good news is it was one for ONLY six passengers and so we are off! Now over 3and 1/2 hours since we landed we ARRIVE at the Okura Hotel, which is so nicely located in Kyoto. Midori-san has tucked bath salts into our "package" and so soon we are enjoying some cha-soba (tea noodles) and then a HOT BATH! ahhh we are IN JAPAN! FLEA MARKET Time! It is the 25th of the month and the day for a historic flea market at the Kitano-tenmangu Shrine. We love flea markets in Japan! We often plan our arrival to Kyoto around the flea market at Toji Temple which is the first Sunday of every month. This trip we are lucky to have our first day on the 25th and be able to enjoy what is called "the second largest" in Kyoto. We meet our friends for breakfast and say goodbye as they board the coach for a tour of Kyoto then we are off in a cab looking forward to the hunt. Immediately we are THRILLED. After walking/talking/hunting and exploring we find our first treasure, a Meiji Period Kutani tea set, it is wonderful! Later two tiny sake cups from the same era and similair pattern. Next we come across a bronze statue that is over 400 years old of the first tea teacher in Japan Sen-no-Rikyu, WOW I want it, but it is heavy and our day has just begun. We chat with the merchant and finally say, we will think about it. Moving along another set of 5 Kutani tea cups a saucers made out of copper with the three symbols representing Sho-Chiku-Bai, bamboo, pine and plum blossoms. Time for lunch and a walk around this lovely area, Cha-Soba again, simply because it is so GOOD. Still thinking about Sen-no-Rikyu and back in the market we find a Haori (jacket slightly longer than the waist) with Cha Accessories in the design, it is VERY COOL, we have never seen this pattern before! Finally not able to leave him here we go back and acquire the bronze, gosh it IS heavy, but AWESOME! Back to our hotel to store our treasures and off to the Kyomizudera Temple. We find our friends and enjoy the walk around this fabulous set of Temples. A few of the ladies followed our best friends lead and purchased Temple books. These are plain white folding paper books which are used for the calligraphy and stamps of each Temple. Normally a monk does a page for you in exchange for a small donation (about $3.00) at the end of a tour you have a FABULOUS treasure full of symbolism, memories and one of a kind artwork. Once in this AMAZING structure they understand and really enjoy! Up and Up and UP the escalators we go, over 13 floors listening to life music and in the middle of the "hustle" to some of the best food, department stores and excitement in Kyoto. We choose Italian, hehehehe this may seem funny, but it is good and a place we seem to visit on each trip. Good red wine, some "interesting" fish, pasta and super thin crust pizza and everyone is satisfied. It has been a LONG day for everyone, so we are back to the hotel for a hot bath and some rest. Today our friends are off Kinkakuji Temple sometimes called the Golden Pavilion and its gorgeous gardens and the Ryoanji Temple with its awesome rock garden. It is raining slightly and we are thrilled for them, knowing just how auspicious these two very famous gardens are in the rain we know they will have a great time. We are on our way to visit a very famous Tofu restaurant in Kyoto with our friend and local exporter. Now this is just one of the reasons why doing business in Japan is so GREAT! In our previous American business encounters we would have lunch and conduct business and then be on our way, that was the whole purpose of the lunch meeting. In doing business in Japan however much time and effort is spent in developing a relationship. It is very important for both sides to know each other understand the goals of each persons overall life mission and to develop a level of trust far beyond a single business transaction. In many ways it like courting and getting married, business in Japan is all about the relationship and ensuring you are doing business with someone you would be proud to invite into your home. So with all the times we have been to Kyoto we have never been to this amazing restaurant. You arrive at the door of a huge marble foyer with nothing more than a few low stools and flower arrangement, taking the elevator down a few levels you are transported into an atmosphere of tatami mat rooms, very low doors, a private dinning room for four where we all sit on the floor and a non-stop parade of the most beautiful pieces of artwork you can imagine. Now I know some of you may think tofu? how can it be? but you simply must experience something like this to understand. 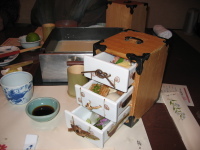 After several dishes of handmade delicacies and small tansu (chest) is presented at each place with each drawer filled with more fabulous art pieces. I could go on and on but lets just say four hours later we had finished our lunch. Our host and his wife then present us was a beautiful lacquer box and two sets of chopsticks each with a hana (flower) inlaid AWESOME! We too exchange gifts from our home town and then we said our goodbyes with a promise to visit their home next trip in Osaka. Back to our hotel for a little rest because we have yet another big meal planned tonight with our friends and the entire group. We visit a traditional local restaurant located in an old wood structure within Maruyama Park. It is a gorgeous spot with many gardens and teahouses along the rocky pathway. It is very dark and now wet because the rain did increase today, but the moon was now out and the water-drops seem to dance on the tree top leaves as we stroll our way into the park to this wonderful traditionally "feeling" place. We have walked this park many times but have never had a meal here. Tonight is special because it is a Shabu-Shabu style with all of us sitting on tatami mats at very low tables topped with a hot pot in which we will cook our own meal. Many of the people on this tour have never experienced this and so it is really much fun to watch their delight and awe as they experience this wonderful way of enjoying a meal. Later as we finish our meal a Maiko appears and comes to sit at each table and answer questions about her most structured yet artist way of life. She is only 19 and still in training to become a Geisha. There are still four schools in Kyoto who train girls for over 4 years in the arts, tradition and grace of becoming a Geisha. It is believe there are now only about 4 or 5 hundred Maiko and Geisha in Kyoto today. Later the older Geisha who has come with this young Maiko plays the Shamisen (3 strings) while the Maiko performs two fall dances. We coach back to our hotel knowing tomorrow will be another full day with a few hours in the coach before we arrive in Kobe. We say goodbye to Kyoto as we head for Nara. As we walk to the Temple we are met with some of the most friendly deer we have seen, many coming to you and picking any paper you have out of your pockets. However if you feed them a deer `cookie` they receive it in the proper Japanese manner by bowing as they take it. Todai-ji Temple is home to the great Diabutsu, the largest bronze Buddha in Japan reaching 55 feet and weighing 452 tons, he sits in the largest wooden building in the world! Within the same garden area is the Kasuga Shinto Shrine, the largest in Nara City. The four main Shrines are dedicated to the deities Takemikazuchi-no-mikoto and Futsu-nushi-no-mikoto and divine ancestors of the Fujiwara family Ame-no-koyane-no-mikoto and his consort Hime-gami. Before we reach the Vermillion Shrine however we walk the path of over 2000 stone lanterns and because we have arrived during one of the special times of the year in which families bring their children who are age 3, 5 or 7 to the Shrine, we are able to enjoy many beautiful children dressed in traditional kimono. We are served lunch within the garden and begin to see only a tiny amount fall foliage but fabulously manicured black pine before we are off to Kobe. On our way to Kobe we stop to visit the Horyu-ji Temple, regarded as the cradle of Japanese Buddhism is a UNESCO World Heritage Site with more than 2,300 items considered of historical importance. Finally we check into another Okura Hotel for our last hotel stay before our cruise. We are up early and go exploring the coastline of Kobe. Here we find many photos of what happened here in 1995 when the big earthquake hit and over 6,500 people were killed. It is amazing to see just how fast this entire town has been rebuilt, preserving some of the traditional feeling while developing a totally modern city. We have a tour today of another UNESCO site, Himeji Castle which was built in 1333. This castle/fort was home to many lords over the years finally serving as a fortress to the Tokugawa Shogun who used it to control the Southern Region of Japan. Along the eaves we are able to identify most of the lords by the marugawaras (a circle tile of the family crest). After touring both the gardens and the towers of the Himeji it is time to board our coach and head for the Spirit of Oceanus, we are looking forward to the experience. Before we depart however after all of the formalities we are treated to a Koto Perfomance by a local group. There are three ladies playing the Kotos' and a man playing the Shakuhachi and all I can say is the entire room seemed to finally KNOW they were IN Japan......it was BEAUTIFUL and excuted without a flaw. Our welcome by Kobe was complete when they gave the ship several floral arrangements, some sake and a very WARM welcome before we set sail. I think we will be back to visit Kobe futher in the future. Our day begins with a walk within Ritsurin Park. There is really not much fall foliage yet as the summer was so hot this year everything seems to be a little late, however the garden is still very nice. We are able to visit the Kikugetsu-tei, the beloved teahouse called Chaya where generations of feudal lords would drink tea while they developed strategic plans and get a few photos. Now our group splits with some going to visit the Shikoku-mura (Shikoku Village) which is an open air museum the recreates life as it was during the Edo and Meiji Periods and others going to the Yashimaji Temple. We have been to this village before so our choice is the Temple. There is a pilgrimage in Shikoku of 88 Temples and Yashimaji is the 84th located on the top of Mt Yashima. It is GORGEOUS up here with a vermillion lacquered main building and several Tori Gates leading to various smaller Shines. The Seven Gods are here carved out of large stones and Kannon stands over 10 feet tall just beyond the entry gates. There are many people visiting who are in fact completing a Pilgrimage and we are lucky enough to find the book where each Temple is shown with a place to keep your visiting cards safely. After we pay our respects we stroll within the grounds along some local shops. Here we find what just might be our most treasured Treasure of the trip a marugawaras (a circle tile of the family crest) cast in gold of the Tokugawa Crest! It is obviously very old but we can not tell exactly how old because it has been recently (with the last 50 years) framed and is behind glass. With little time to consider just how we will get this treasure home, we quickly pay, wrap it and dash to catch our coach. We are THRILLED! I can not remember just how many times we have visited Korakuen Garden but it is truly special each and every time. We have seen it with full sakura and full fall foliage but today it shows a different beauty in an almost quiet way since fall has not really yet hit this area. Within the garden is a small tea plantation and two teahouses the Mosho-an and the Gojusantsugi Koshikake-Jaya Teahouse, we are able to visit them both. We were also able to see the Japanese Cranes which we happy to pose for us and we again met up with the photographer whose book we purchased about 6 years ago showing all of the glory of this garden in each season. We were happy and sadden to learn he has completely sold out and now has only some post cards of his amazing photos for visitors to bring home with them. Korakuen Garden is said to be one of the three most beautiful gardens in Japan and seeing it today without the blast of blossoms or the fire of fall I can still see the fabulous attributes which make it among to most precious gardens in Japan. Our next stop is Kurashiki a beautifully preserved area along charming canals. This area is famous for Bizen pottery a very organic looking and feeling style. We find a wonderful teapot which looks much like a rock and five tea cups with a base that represents the lotus stem and flower. We also found a nice example of Bizen-ware in a bamboo shaped flower vase and a Jizo (the protector of women, children and travelers). The Ohara Museum of Art is here filled with Western style art and many of our new friends enjoy this 1930 private museum built to commemorate Kojima Torajiro, a Western-style painter who died in 1929. This private museum is the oldest in Japan. Miyajima one of my most FAVORITE places on earth! I am so happy to be back. We anchor offshore and need to zodiac onto the island and then walk about half a mile before the Tori is within sight. Each time I see it I simply get an almost overwhelming feeling, I really am not sure why. However today our timing is such that the tide is out and I am sorry those who have never seen this awesome sight see it without the water. However once in the Itsukushima Shrine we are blessed with a Bugaku dance accompanied with the orchestral gagaku ensemble. This is the first time we have ever seen this ancient performance which dates back to the 6th century and we were lucky enough to be in a spot that allowed us to fully capture this on video! We will be posting that once we return home and so others will be able to enjoy this very special ceremony. A few people from our ship join us as we walk up the stairs to the Daisho-in Temple. Here we spin the brass prayer wheels which have six hundred volumes of Dai-hannyakyo Scripture as we climb the stairs. Once on top we are able to visit the Kannon-do Temple which has a gigantic Mandala created in colored sand depicting the divine figure of Kannon Bosatsu, the Goddess of Mercy. This Mandala was created by Buddhist priest from Tibet. We also see the gold image of Kannon with eleven heads, implying a commitment to look for all living creatures on earth and to show them mercy. Once enshrined at Itsukushima Shinto Shrine we can see the close connection between Shinto and Buddhism in Japan. Next we visit the Henjyokutsu Cave filled with the principal Buddhist icons of the 88 temples of the pilgrimage route in Shikoku. Some believe visiting this cave is the next best thing to actually going to each Temple. We have been here a few times but still want to actually make the pilgrimage to each Temple some day soon. A few more Temples and Shrines and our friends must say goodbye as they sail off of Hiroshima. With so little time in Miyajima we decide to stay behind and simply enjoy more of this very auspicious place. Lunch is Okonomiyaki (Japanese pancake filled with cabbage) Hiroshima style and then we discover a few new Temples and Shrines we had not before seen. Finally we too must say goodbye to our beloved Miyajima as we board a jet ferry to Hiroshima Harbour. Looking for an internet cafe we find a reflex massage and well, we decide to further delay our posting in lieu of what turns out to be one of our BEST yet! A short local train and then a very close cab ride away we are back on the ship joining our friends as they return from the Peace Park. Kyushu is the southernmost of Japan’s four major islands. Beppu is located on Kyushu’s eastern coast with more hot springs flowing here than anywhere else in Japan. We visit Jigoku (the Hells) with the boiling ponds bubbling in different hues ranging from red to aqua. After a foot bath in hot mineral volcanic water we are off to Yufuin for a real bath! Yufuin is the home of “Haruka” a Japanese celebrity performing in the Sub-titled weekly soap opera we like to watch. Here we find the quiet mountain spa town we have visited several times and long for every week as we enjoy this program. For us regardless of how many times we visit a place in Japan or see the scenery of Japan we long to be there! Perhaps someday we will actually live in Japan but for now, let us share with you the pleasures of the BATH! ? In North America the bath is all about getting clean. In Japan the bath is a social event that is really all about relaxing and enjoying nature. You first take a shower to get clean and then enter the bath to relax. It is HOT and so you stay only a short time either sitting out on the rocks or moving to a cold bath to cool down, coming back to the hot Onsen waters time and time again. Until recently Onsens were all about health and only really enjoyed by the old or ill, today they are true resorts with many baby-boomers enjoying the benefits and pleasures. We are traveling our route this time with some of our dear friends who are experiencing Japan for the first time and although some of the amenities of this ship are somewhat lacking in terms of small ship cruising their effort to really allow you to experience the country is wonderful. We are very pleased that a bath experience has been built into the cruise itinerary. Very few take advantage but those of us who do totally ENJOY! Baths are divided into male and female baths, each with their own beauty. When you stay in the Onsens normally the baths switch from morning to night from male to female, today we must enjoy only one. I am pleased that I can help some of the ladies enjoy this experience. Our female guide is not Japanese and not very experienced with the Onsen. After our bath we are treated to a Japanese lunch and then we are leaving Yufuin for our ship and on our way to Nagasaki. As you might guess the main attraction here is the Peace Park commemorating the 75 plus thousand people who died during World War 2. The Atomic Bomb Museum presents events leading up to that fateful day, the devastation, postwar restoration, and its subsequent role in promoting international peace. We have been before and so today we opt for a shopping experience. We find a used kimono shop and I am delighted to find two I simply must have, one in bright blue and one with an aqua print. As we shop there is actually a television show being taped and they ask our permission to film us. It is really GREAT FUN as the local movie star is so dramatic as she discovers wedding kimonos and they are so pleased to see us trying on traditional everyday kimono. After our fun shopping experience we decide to enjoy Okonomiyaki one more time for lunch and then head off to see Dejima. The sea gate of this island is of great symbolic importance as it was the window for Japanese and Western culture, science and trade during the period of isolation. The gate featured two portals, one for imported goods and one for exported. With trade limited to only the Dutch, Chinese and Korean’s this island became the residence for the Dutch and Japanese officials tasked with the administration of trade. Totally enjoying our new found textile skills we must now say goodbye as we set sail for South Korea. Gyeongju has been designated by UNSECO as one of the world’s 10 most historically significant sites. Our tour takes us along the ancient tombs and through the brightly painted Buddhist Temples. Most of the tombs still remain unopened, however in 1974 the tomb of Ch’onmach’ong was excavated. This tomb was chosen because it appeared to be smaller than most and specialist wanted to make it their first attempt. Today we are able to see the work conducted to uncover over 10,000 separate artifacts, now on display at the National Museum. Excited by the significant discovery, plans to excavate more continue to be discussed by local officials however after uncovering so much from this seemly “smallest” tomb the task is tremendous. After our visit to the gorgeous Temple with Fall Color in full blaze we enjoy a local lunch with beautiful dancers performing for us. As we finally make our way back to the ship we are treated to stroll within the local market to explore with all of our senses the local color and flavor. Hagi is a quiet, quaint town with a history of Samurai, Feudal Lords and the culture and art which is often associated with castle towns. Our day begins with good fortune of being both a Sunday and the beginning of Cultural week in Japan! So as we tour the Shoin-jinja we are able to enjoy many families dressed in kimono as they stroll along the Shrine grounds dedicated to Shoin Yoshida, the scholar and Shomon shrine dedicated to his students. This is a beautiful place but certainly seeing so many visitors dressed traditionally adds a magic to the day. We are able to visit the Kagetsuro (teahouse) which was designed by Fuhaku Kawakami, the founder of Edosenke school of the tea ceremony. After strolling along wonderfully preserved streets we find ourselves inside the residence of Tsunahiro Mori, the second lord of the Mori clan. This is one of the largest among these beautiful Samurai homes with perfectly simple yet intricate gardens. Our next stop is the Daishoin Temple, built by Tsunahiro Mori as a family temple dedicated to Hidenari, the first Mori lord. All of the even-numbered lords were subsequently buried here with the odd numbered buried at Toko-ji Shrine, considered the greatest temples of the Obaku-school in Japan. Both have over 500 stone lanterns leading up to the graves and both have been designated as national cultural properties. As beautiful as these places are it is now time to enjoy the Hagi Uragami Museum. Established by Toshiro Uragami this collection includes about 5,000 ukiyoe prints and about 400 ceramic pieces. Of course the collection is wonderful but it is enhanced again by visitors dressed for cultural week in traditional kimono. There are some wonderful books in this museum store and as much as we try to resist adding the weight to our travels we seem to always add a few books along the way and today is no exception. After seeing so many wonderful ceramics our desire to search for a few of our own it peeked. Hagiyaki (pottery from Hagi) is perhaps what this lovely town is now best know for. Hagiyaki have been beloved by tea masters for a long time, originated between 1592 and 1598 when Hideyoshi Toyotomi fought several battles in Korea. The tea ceremony played an important role in politics in those days as the great tea master Sen-no-Rikyu (some times referred to as the father of tea in Japan) completed “Wabi-cha” his philosophy of tea. 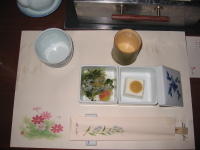 Wabi-cha was very popular among the feudal lords and Korean teabowls were highly prized. Later Terumoto Mori brought two potters; Lee Jak Kwang and Lee Kyung to Hagi from Korea. The potters built a kiln and produced teaware for the Mori clan. Lee Kyung was given a Japanese name, Koraizaemon Saka in 1625 an appointed as the official clan potter, in 1663 two others were designated, Kyusetsu Miwa and Hanroku Saeki. Saka’s kiln, called Matsumotoyaki, made pottery only for the lords of the clan while Matsumoto’s divided kiln, in Otsu County, called Sounoseyaki, made pottery for everyone else. Kyusetsu Miwa having studied under Saka and then refining the style further in Kyoto was designated as a national living cultural treasure. After the Meiji era Matsumotoyaki and Sounoseyaki both were simply called Hagiyaki and today remains highly collectable in Japan and beyond. Is it the garden that makes this museum or is it the museum that makes the garden? A step within the entryway and you enter the world of profound harmony created by the superb Dry Landscape Garden and mountains behind. Based on the belief… “The garden is a picture scroll, a living painting” the founder Adachi Zenko set out to create the ideal garden to ensure visitors could more fully appreciate the museum’s collection. His devotion to every tree and blade of grass resulted in this Japanese garden collection consisting of; a Tea Garden, Moss Garden, Dry Landscape Garden, Pond Garden and White Gravel and Pine Garden. As your heart is filled with the beauty of the gardens the journey of soothing silence into the much anticipated world of artworks begins. This fascinating collection includes not only masterpieces by great artists that have an important place in the history of modern Japanese painting, but also ceramics, woodcarvings, douga (illustrations for children) and maki-e (gold-lacquered works). If you allow yourself to drift you can hear the whispers of the artists talking to you through their works. The combination of the artworks, the beautiful structure they are housed and the gardens gives you a very peaceful fulfilling experience. Our visit would not be complete without enjoying a bowl of matcha tea in the teahouse and of course taking in a glimpse of the private tea garden. Now for me that the dream of Adachi Zenko to “move the heart” has been achieved! Matsue Castle is our next stop. There are only 12 castles remaining in Japan and Matsue is the only one in the Sanin region. This castle is the second largest, the third tallest and the sixth oldest amongst the castles. It is wonderful to see, however as I walk the grounds my mind continues to drift back to the amazing gardens we have just left. For me this stop in Matsue will be most remembered as the Adachi garden and museum destination. Kenrokuen Garden has been designated as a cultural property and national site of special scenic beauty. As we arrive there is a light rain making the experience, for me, even more special. I LOVE gardens in the rain! We have been here a couple of times but today we will spend time exploring not only the gardens but also the Seison-kaku (samurai style home) built by Maeda Nariyasu, the 13th lord of the Kaga clan, for his mother Shinryu-in to live. The Seison-kaku is distinguished for its unparalleled refinement and elegance. Several national treasures remain in the home and we are able to view them easily. Shinryu-in is a cultural asset and it is an honor to be able to walk within the ekken-jodan-no-ma (audience chamber) with its’ refined touch of shoin style, the Ayu-no-roka Corridor with the ceiling covered with paper from the palace and shoji screen with Ayu (sweetfish) painted on them, the Kame-no-ma (tortoise chamber) is a bedroom with shoji painted with tortoise and the Tsukushi-no-roka with its unobstructed view of the garden. The last major room is the Cho-no-ma (butterfly chamber) used as a living room of sorts. Butterflies adorn the shoji panels and ceiling, the tokonoma and the iri shoin (built in reading desk) have butterflies carved in the camphor wood which is rarely found in the region. After enjoying a very detailed guided tour we must say goodbye as we stroll more of the Kenrokuen garden on our way to the Shiguretei Tea House. Here we enjoy the private tea garden and a bowl of matcha then suddenly we notice rain has stopped and it is time to leave this beauty peaceful place. The last day of our cruise our ship docks in Niigata we say goodbye to the crew and board the Shinkansen for Tokyo. Asakusa is our first stop in this capital city. Asakusa is an area full of fast moving shoppers all walking talking and enjoying as they proceed along and between several Shrines, Temples, Gates. Sensoji (the official name) is dedicated to the bodhisattva Kannon, the goddess of compassion. According to legend, the statue of the Kannon was found by two fishermen. Hajino Nakatomo, the headman of their village, recognized the sanctity of the statue and enshrined the statue by remaking his own house into a small temple in Asakusa so that the villagers could worship the god. The blessing of the Kannon gradually received a higher reputation throughout Japan and people from near and far flocked to pray to the god. During the Kamakura period (1192-1333) it became the center of worship for the Kannon’s ardent devotees. Millions of visitors now come every month to pray for the Kannon’s blessings for both themselves and their families and give thanks for the patronage of the god. The Kannon is worshiped in many families in Japan as the Virgin Mother Mary is in Western countries. The face of Kannon is often depicted as that of a gentle and noble lady. According to Buddhist teaching, the Kannon is the god of compassion and has great power to release human beings from all kinds of sufferings. Kannon has great power to purify people and help them obtain true happiness. The sutra says “As soon as people’s cries of agony reach the Kannon, the bodhisattva takes pity on them and saves them from the torture of the Hell. If people offer sincere prayers to the Kannon, even fire cannot burn them, and water cannot drown them”. Using Tokyo as our new “home base” we explore more of the city and take day trips out to Mt. Fuji, Hakone, Nikko and Kamakura. Mt. Fuji is a volcano that was formed over hundreds of thousands of years ago. In the Komitake Fuji Period (700,000 – 200,000 years ago) at the time of the Beijing Man and when the Japanese climate was passing in and out of glacial and interglacial periods the Komitake Volcano was formed. In the “Old Fuji Period” (80,000-16,000 years ago) It is presumed from analysis of volcanic ejecta, that the eruptions were particularly violent. In the “New Fuji Period” (14,000 years ago to the present) about 10,000 years ago, eruptions that would later form the New Fuji Volcano broke out between the respective craters that formed the Old Fuji and Komitake. These eruptions eventually covered the peaks of both these older volcanoes, forming the Fuji that we see today. The eruptions grew less violent and by 8,000 years ago New Fuji had attained the beautiful shape it has today. There is a tremendous amount of mystery and interest in Mt. Fuji still today. It is the subject of many artworks and climbed by those seeking special blessings. Most days she hides her peak in the clouds making it one of the most sought after views of visitors. On our day trip we were in fact blessed and the sky opens to allow us to see the beautiful peak from the viewing station and then again when we reached the 5th station (about ½ way up). We have been lucky and have seen the peak each time we have gone, however the statistics give you about a 20% chance. We were THRILLED our friends were able to see the top on their first visit! A short ride to Haknoe and then a boat trip along the beautiful lake takes us to the cable car where we are able to ride to the top of mountain and see the entire Haknoe area. We arrive just before sunset and so the view is FABULOUS with a sky that is in and out of clouds. A very nice day and a wonderful way to conclude our day trip before returning to Tokyo. FINALLY we get to see some great autumn color! This entire trip should have been full of fall change however this year the summer was particularly hot and many of the leaves had dried and died before really changing color. Nikko is north of Tokyo and we are so happy to be able to enjoy this autumn feeling and bright landscape. As we walk the Toshogu Shrine and Rinnoji Temple grounds we have a guide explaining first the huge Stone Torii Gate, then the entry gate, five-story Pagoda and the stable house with the carvings of the three monkeys all showing symbolic “stories” of life lessons. We are able to go into the Yakushido Temple (crying dragon) and listen as the monk clangs two pieces of wood together as he walks around this room, never is an echo heard until he stands directly under the huge dragon painted in the ceiling and then, yes the echo or “cry” can be heard. We make our way back to the Sakashitamon Gate (sleeping cat gate) which is the entry to the inner shrine and Ieyasu Tokugawa’s tomb. As we leave this beautifully forested Shrine and Temple area we make a stop into a small garden with a teahouse and several different varieties of Japanese Maple all in different shades of red, orange, gold and yellow. Truly a BEAUTIFUL garden that is able to fulfill our desire to see autumn! Back to Tokyo we must go now to experience the Ginza with its’ evening lights, action and people! Would not want to live here but WOW what fun for an evening. On our last morning we enjoy some final shopping including a visit into the famous Mitsukoshi, I think perhaps the most expensive department store in the world, for sure the most expensive one I have ever been in. So enjoying the experience and not taking any treasures from the store we opt for one more book store experience. With books so easy to purchase online I don’t know why we always feel the need, but we do and we did and yes a few filled the empty space in our bags. Back to our hotel for the airport shuttle pickup and we are on our way! I am feeling ready to leave Tokyo but wishing I was heading to Kyoto instead of San Francisco. Not that I don’t love San Francisco and I feel very blessed to be able to live here, but something about Kyoto just speaks to my heart always making me look forward to my return.